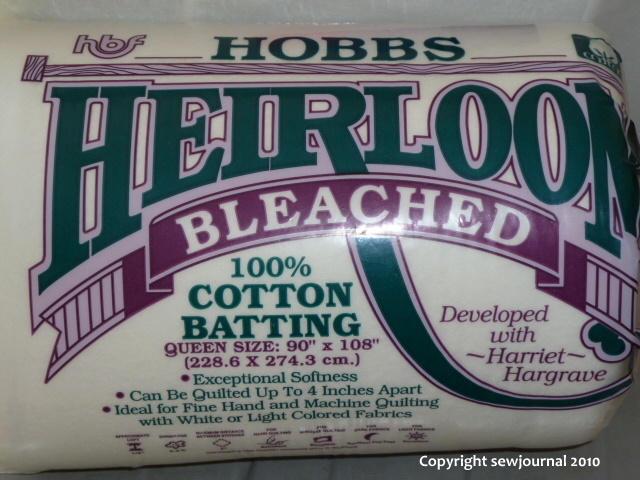 Well, I bought my white thread as well as some black, greys and taupes just to be on the safe side. I also invested in three more thread organisers. Tina Bonifacio who commented on the beauty of my nicely organised thread collection should be happy about that. 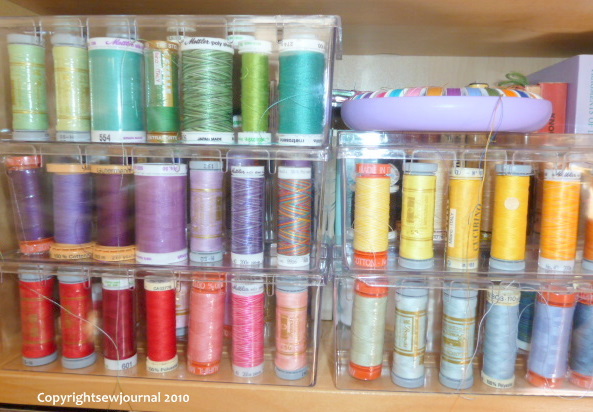 🙂 My thread collection is just about the only organised thing in my sewing room though! Anyway, hopefully I’ll get the “which way?” baby/lap quilt top finished this week. 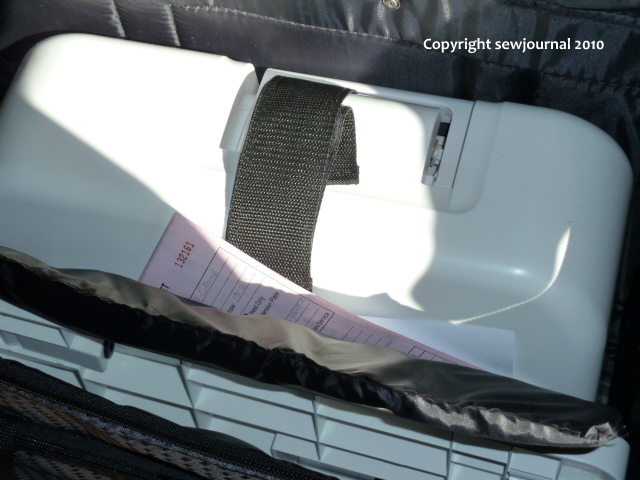 My Janome 3160QDC is back home again. I haven’t had a chance to put it through its paces yet, it’s still snuggling in its tote, but I’m itching to have another go at free motion quilting. I want to practice so I can use it for the “which way?” quilt. Why is it the “which way?” quilt? 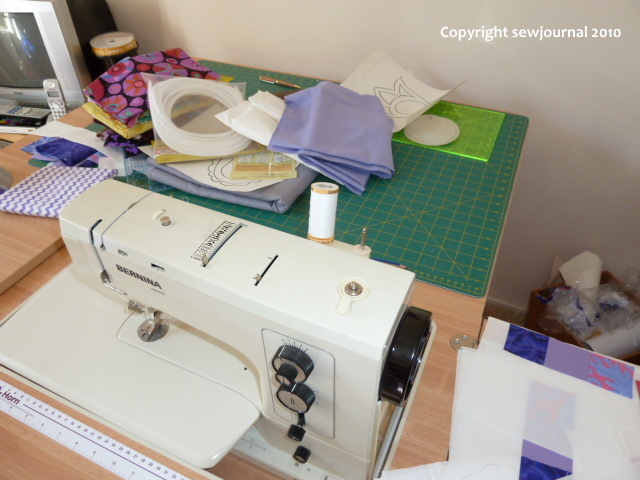 Because I’m spatially challenged and I don’t want to have to do any “unsewing” so, when I pick up each block I ask myself “which way?” – so far, so good it seems to be working. A few weeks ago I took advantage of Hancock’s of Paducah’s free shipping sale and bought some batting. Well they sent me one correct one and one wrong one. They told me I could keep the wrong for the inconvenience caused and they would send me the right one. And they did! It arrived yesterday. Thank you Hancocks! Don’t you just love good old-fashioned customer service! My bargain Kaffe’s have arrived! A while ago Hancocks of Paducah had a half price sale on some of their Kaffe Fassett fabrics. Given that these fabrics cost upwards of $26/metre in Australia I couldn’t pass up sale at half US prices which are already substantially cheaper anyway. As my husband was planning a US trip I ordered some fabrics and had them sent to the home of a friend in the US. Today my husband arrived home and the fabrics arrived with him. What a bargain! A set of fat quarters (supposed to be 28 but actually 29) that were US$79.98 for only US$39.98. (That’s only AUS$1.60 each compared to the usual AUS$6.50+) And two jelly rolls that were US$19.98 for only US$9.98each! And the postage was less than US$8. Want to see them? Here they are. I can’t wait to use them.